On the third of November, 2015, the ECB (European Central Bank) decided to cut interest rates and to extend its quantitative easing. Whilst we interpreted the market’s reaction in the following article, in this article we analyze how the increasing monetary base affects EUR/USD in a long term. In this meeting, the deposit rate was lowered from -0.20% to -0.30%, and the QE programme was extended from September 2016 to March 2017. Thus, we first look into how the monetary base changes by the end of March 2017. 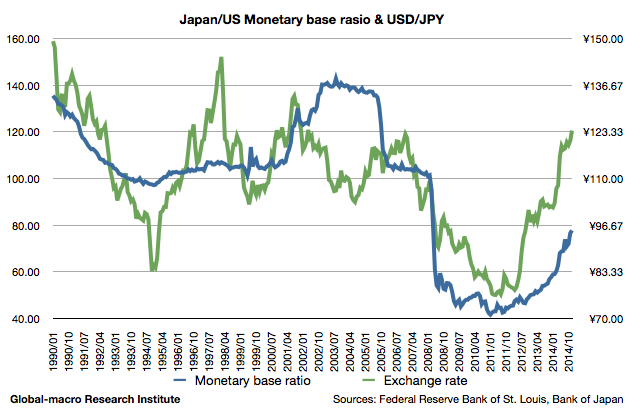 2015-2016: What will happen to USD/JPY when the BoJ expands the QE further? As the BoJ only claimed it would continue its quantitative easing until mid 2016, investors are now speculating whether the central bank extends the easing or not. After the Bank of Japan (BoJ) decided the additional monetary easing on 31st of November, USD/JPY reached 122 once and is now traded around 120. We review if the rate is appropriate from a long-term viewpoint, after the radical depreciation from about 110. 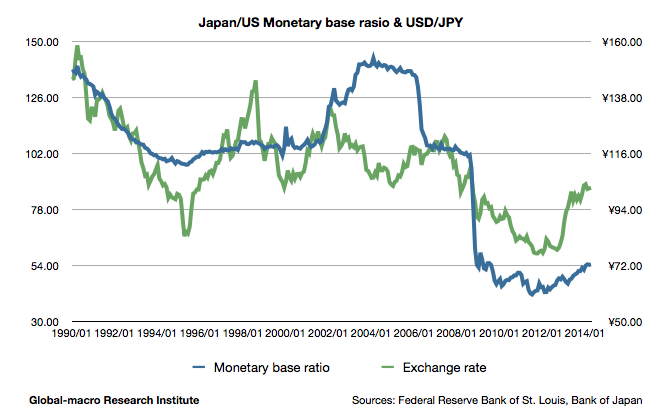 This is the graph of USD/JPY and the ratio of the two countries’ monetary bases since 1990. For a decade since 1995, the amount of the issued yen per a dollar had been around 100 with the exchange rate being around ¥115, but then the Fed moved to financial easing according to the crisis in 2008. As a result, the ratio went down to around 50, which has still been the range until now as both of the central banks have been engaged in quantitative easing. 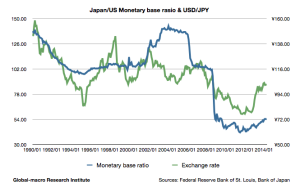 It is assumed that the monetary base ratio will resume to be 70-75 when the Fed totally stops the easing and the Bank of Japan finishes the QE of 2 years. 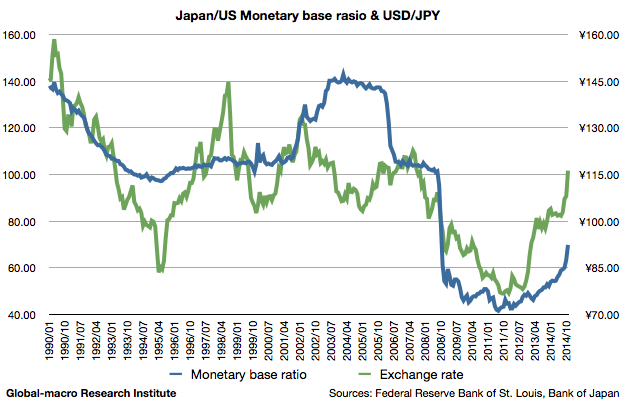 The last time we observed that range of the ratio was from Oct to Nov in 2008, when the exchange rate was around ¥98. To estimate the current due exchange rate from this, we need to consider that the foreign exchange market usually precedes the monetary base, and that in late 2008, the market was in a hurry to reflect the quantitative easing that would be held afterwards. We also need to note that according to the data by the IMF, the real economic growth of the US between 2008 and 2014 is estimated to be 9.2% whereas that of Japan is assumed to be merely 2.8%. Considering these, the current range of the exchange rate, ¥100-105 can be said to be quite appropriate, and due to the Japan’s trade deficit, which hasn’t decreased even with the weak yen, would lead the rate to be ¥105-110 in a middle or long-term. In a short term, investors should be careful of the enormous short positions on the yen, which have been piled since late 2012, although the situation wouldn’t help the speculators demoralise the market, as few factors are seen to change the investors’ long-term view, and the additional QE is still possible if the inflation rate doesn’t increase. The investors would need to move in the Japanese stock market considering this moderate future of the currency market. After a fuss, with the speculators discouraged, the cheap and expensive stocks will just come to the due price, without causing any dominant trend in the Nikkei index.